Deadline to apply for 2018/2019 Ontario-Jiangsu Student Exchange Program. Read more about Deadline to apply for 2018/2019 Ontario-Jiangsu Student Exchange Program. Information Sessions for undergraduate students interested in studying abroad. Mr. Geraint Fox from Goldsmiths University of London will present from 4:30pm to 5:30pm. Dr. Glyn Davis from Glasgow School of Art will present from 5:30pm to 6:30pm. An exchange exhibit between ceramic students from OCAD and University of Regina in which they employ the material qualities and associative meanings of clay to investigate how we engage with others and the world. World So Small will coincide with Craft Year 2007 a nation-wide celebration of professional Canadian craft and was previously exhibited at the 5th Parallel Gallery in the University of Regina last winter. It is also being held in conjunction with Scotiabank Nuit Blanche, September 29. Cradle of the Renaissance, the ancient Italian city of Florence is the perfect place for developing your knowledge of almost any subject. Over the centuries, it’s been home to some of the most significant scientific and mathematical discoveries. Likewise, painters, sculptors, writers and historians living and working here have expanded the frontiers of culture and society. Indeed, the transdisciplinary practices of artists such as Brunelleschi and Da Vinci involved astounding investigations and collaborations in the realms of physics, biology, chemistry, engineering and architecture. Since 1974, OCAD University’s Florence Off-Campus Studies program has been drawing students like me across the Atlantic. 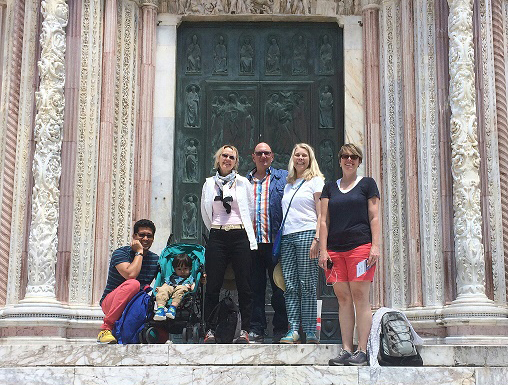 At the time of this writing and for the three-and-a-half weeks that preceded it, I have been living and learning in this amazing terra-cotta Tuscan city with two fellow Interdisciplinary Master’s in Art, Media and Design (IAMD) students: Annette Mangaard and David Salazar. For me, one of the most enriching aspects of my time in Florence has been the opportunity to investigate the interconnectivity of the early Renaissance’s globalized economic and cultural landscape. I have gained a much more comprehensive understanding, for example, about how the guilds, merchants, banks and churches were financially interwoven. I have also discovered that, despite rudimentary forms of transportation and communication, international trade was already occurring. This led to a dynamic exchange of natural resources, artistic skill sets and design aesthetics. Also check out emerging artist Alex Murphy’s Five best things about studying art in Florence. 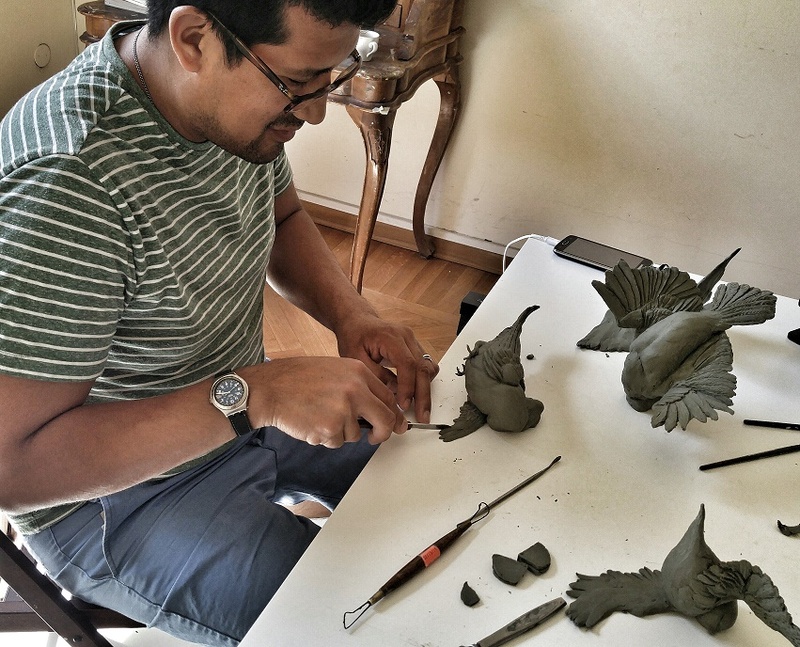 "Aside from the art that Florence is well known for, my experience is best reflected by the work I'm currently resolving, which involves sculpting maquettes of birds at the moment of impact with a wall. I have been greatly inspired by the pigeons that make their way through the city. Although they are viewed as pests, they also embody a sense of elegance as if posing for tourists cameras taking selfies." "I've enjoyed being in Florence, where I've been filming microscopic details of images of flora found within Renaissance paintings. I'll be compositing these with botanicals filmed within the surrounding gardens and courtyards to create layered media work." Why not stay here forever? Given the treasure trove of art and culture that is Florence, it comes as no surprise that some visitors — including OCAD U students — choose never to leave. One such person with whom we have spent time is OCAD U alumna Allison Wooley. In addition to teaching out of her professional studio, Allison restores frescoes and gilding throughout the region, and procures large commissions designing and painting replicas of antique harpsichords. "At that time (the 1980s), the artisan community was flourishing. Almost every arch or doorway was an artisan studio making lovely things. I found the courage to start looking for work, and one studio eventually let me in. I learned so much there and continued to learn by inviting master artisans into my studio to teach." These artisans are fun-loving and generous individuals. They have taught me and many others water gilding, egg tempera painting, true fresco, grisailles and other techniques and traditions unbroken since the Renaissance. Over the years, I have also learned the tenets of harmony, proportion and colour, while appreciating and absorbing both the natural and manmade beauty of Florence and Tuscany. It is with a heavy heart that I will leave this magical place. However, I will depart knowing what a rich experience I have had, and with the comfort that I will return. How do I know this? 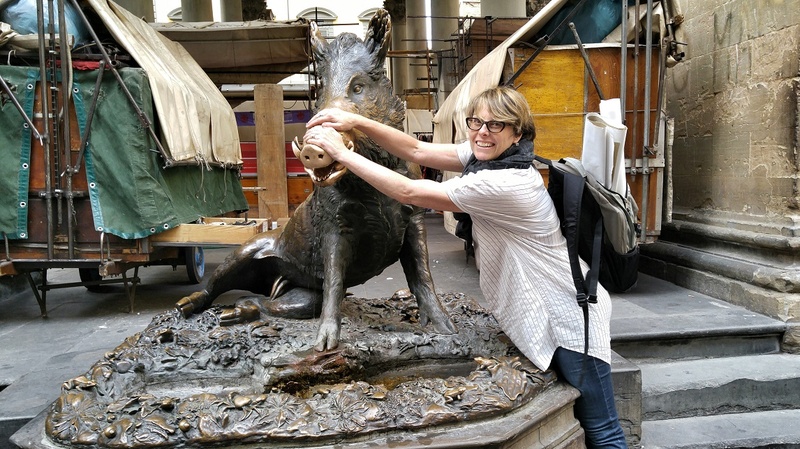 I rubbed the snout of Il Porcellino — the little pig — just to be sure. Grazie. Prego. Ciao! A little bit of Italian goes a long way. State-of-the-art walking shoes are a must. Rent a place with a small kitchenette. No one can afford to eat out in Florence three times a day. If you plan on touring a church: women must have their legs and shoulders covered to enter. I haven’t seen any men turned away yet, but I am assuming sleeves are a must. Do not exchange your money at the airport in Florence! I repeat, do not exchange your money at the airport in Florence! Don’t bring over your studio supplies. The art stores are well stocked, affordable and the staff are super friendly. Be sure to ask for your student discount if they don’t ask you first. Wifi is free in parts of the city, so you may be able to skip buying a SIM card by registering for FONGO, a free telephone service, and using Facebook messenger. Pack half the clothes you think you will need. The fashion rocks here! Never say no to opportunities to tour in or outside the city. The books and studio will always be there when you get back. Jill Price is the curator and education officer at Quest Art in Midland, Ontario. She is currently a student in OCAD U’s Interdisciplinary Master’s in Art, Media and Design (IAMD) MFA program. OCAD University announced a research and educational partnership with the Jerusalem-based Bezalel Academy of Arts and Design. The agreement will promote student, faculty, research and innovation linkages between the two institutions as well as enrich understanding between Israel and Canada. It will also serve to increase the impact of the creative industries in each country and globally. “OCAD University is pleased to contribute to Ontario’s global success through this partnership that will also expand our global impact,” said Carole Beaulieu, OCAD University’s Associate Vice-President of University Relations. Beaulieu is part of the Premier’s Mission to Israel and the West Bank and signed the agreement on behalf of the university. Leverage the talent and expertise in Ontario’s specialized art and design incubator (OCAD University’s Campus-Linked Accelerator, Imagination Catalyst) and share its brand of creative entrepreneurship, particularly its inclusive design and strategic foresight expertise, with Bezalel Research Authority and Bezalel Labs, linking to Middle Eastern partnerships through the collaboration. "I look forward to seeing the creative minds at OCAD University and Bezalel Academy of Arts and Design collaborating on arts-based research projects," said Ontario Premier Kathleen Wynne. "This partnership will lead to more opportunities to learn about Ontario’s and Israel’s cultures through art and design, and it will also open up new business markets for the creative industries in both regions." “Bezalel Academy's newly expanded partnership with OCAD University reflects our outreach for excellence through international research and innovation, in the fields of art, design and architecture,” said Liv Sperber, Vice President for International Affairs, Bezalel Academy of Arts and Design. The Bezalel Academy of Arts and Design, Israel’s oldest institute of higher education, was established 110 years ago by Prof. Boris Schatz and is currently Israel’s leading academy of art, design and architecture and one of the most prestigious of its kind in the world. Bezalel and its many generations of graduates are at the forefront of the local and global artistic scene and are instrumental in shaping and enriching Israel's cultural identity as well as contributing greatly to the national achievements in the hi-tech industry and society as a whole. As Ontario’s only and Canada’s leading art, design and digital media university, OCAD University brings specialized capacity to the workforce, creating jobs, stimulating innovation and research, and contributing to economic development in Canada. Through the delivery of experiential, hands-on learning and through specialized programs — such as those offered by the Imagination Catalyst — the university supports individuals and teams in the development of startups and the building of cross-sector partnerships. The contexts for such work are remarkably varied: information and communication technologies (ICT), digital, mobile, the health sciences, gallery and exhibition venues, design studios, government and the cultural industries.